An icy cold, carbonated beverage is just the pick-me-up you need when the day really starts to wear you down. So, wouldn't it be even more rewarding and fulfilling if you could make your own from scratch? Crafting a great carbonated beverage is easy! This informative guide to making soda at home is perfect for anyone looking to create delicious artisan drinks with or without a soda machine. Jeremy Butler breaks down the science of carbonation so you can discover recipes that are easily adapted for each of the three methods for carbonation. 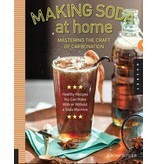 He even shows you how to make a soda bar, complete with kegerator, in your own home! Offering resources like homebrew forums, shopping guides, and industrial suppliers, all the information you need to make your own soda is right here. Once you master the bubbles, it's time to add the syrups. 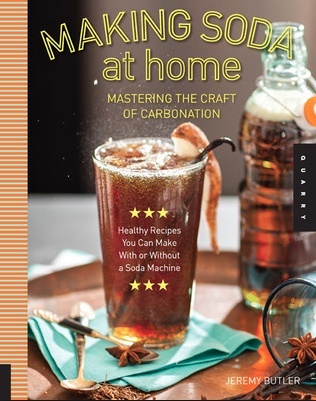 Making Soda at Home offers over 35 natural and healthy recipes to flavor your fizz. It even provides insider tips on creating your own recipes. Try refreshing coconut-lime or peach sodas on a hot summer day. Tonics like root beer, sassafras, sarsaparilla and ginger ale are delicious with a bowl of popcorn and a movie. Brew expert clones of your favorite dews, peppers, pops, and colas with ease. There's even a recipe for butter beer! Perfect for any do-it-yourself foodie, Making Soda at Home will have you drinking natural homemade soda in no time.